There are two required ingredients in any SQL query: SELECT and FROM—and they have to be in that order. SELECT indicates which columns you’d like to view, and FROM identifies the table that they live in. To see the results yourself, copy and paste this query into Mode’s Query Editor and run the code. If you already have SQL code in the Query Editor, you’ll need to paste over or delete the query that was there previously. If you simply copy and paste this query below the previous one, you’ll get an error—you can only run one SELECT statement at a time. So what’s happening in the above query? In this case, the query is telling the database to return the year, month, and west columns from the table tutorial.us_housing_units. (Remember that when referencing tables, the table names have to be preceded by the name of user who uploaded it.) When you run this query, you’ll get back a set of results that shows values in each of these columns. Write a query to select all of the columns in the tutorial.us_housing_units table without using *. Note: Practice problems will appear in boxes like the one above throughout this tutorial. Send to all your friends by email or Slack! 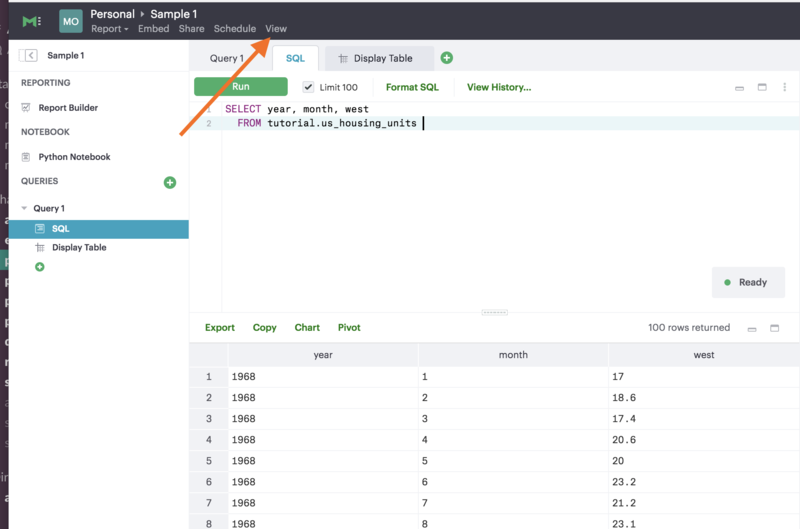 You’ll land back in the Query Editor, where you can edit your SQL, your charts, or your reports. What actually happens when you run a query? Let’s get back to it! When you run a query, what do you get back? As you can see from running the queries above, you get a table. But that table isn’t stored permanently in the database. It also doesn’t change any tables in the database—tutorial.us_housing_units will contain the same data every time you query it, and the data will never change no matter how many times you query it. Mode does store all of your results for future access, but SELECT statements don’t change anything in the underlying tables. While most capitalization conventions are the same, there are several conventions for formatting line breaks. You’ll pick up on several of these in this tutorial and in other people’s work on Mode. It’s up to you to determine what formatting method is easiest for you to read and understand. While we’re on the topic of formatting, it’s worth noting the format of column names. All of the columns in the tutorial.us_housing_units table are named in lower case, and use underscores instead of spaces. The table name itself also uses underscores instead of spaces. Most people avoid putting spaces in column names because it’s annoying to deal with spaces in SQL—if you want to have spaces in column names, you need to always refer to those columns in double quotes. Without the double quotes, that query would read ‘West’ and ‘Region’ as separate objects and would return an error. Note that the results will only return capital letters if you put column names in double quotes. The following query, for example, will return results with lower-case column names. Write a query to select all of the columns in tutorial.us_housing_units and rename them so that their first letters are capitalized. Find the report but not the SQL? 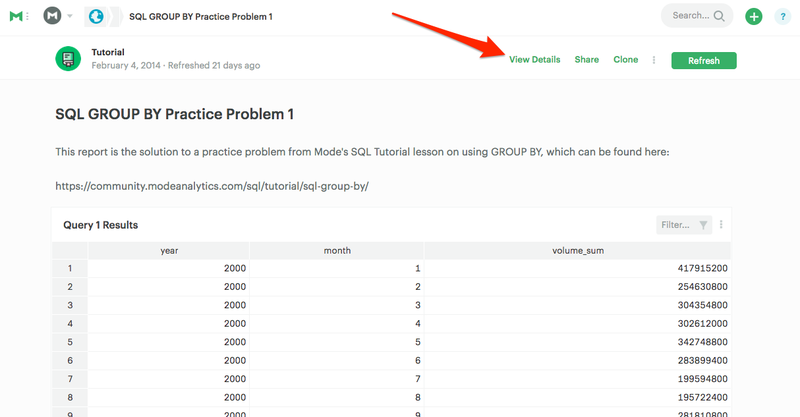 Once you’ve got the report open, see the SQL powering it by clicking on “View Details” at the top, then clicking “SQL” in the sidebar on the left.